In the years immediately following the end of World War II, a young ex-Luftwaffe technical officer began experimenting with designs for a vehicle suitable for the thousands of Germans who had lost limbs during the war. Over the next dozen years, Fritz Fend's concept would evolve into one of the most successful of Germany's many micro-cars. A Fend Flitzer showing its age. The condition is not surprising considering it was 52 years old when this picture was taken. Photo courtesy of the Messerschmitt Owner's Club. It wasn't an easy job; under the Morgenthau Plan, the victorious Allies had initially imposed very strict controls on German manufacturing and many of the factories that had survived bombing and shelling were dismantled and their tools sent to other countries as war reparations. By 1946, the Western Allies, responding to the growing threat posed by the Soviet regime in East Germany, began to relax some of the controls. However, production of civilian vehicles and aircraft were still forbidden. Barred from practicing his trade as an aeronautical engineer, Fend set up shop in Rosenheim, a small town in Bavaria, where he began work on his new vehicle, which he dubbed the "Flitzer." Since the Flitzer was intended to be a mobility aid, rather than general-purpose transportation, Fend was able to skirt many of the restrictions. In addition, the VdK ("Verband der Kriegsbeschädigten, Kriegshinterbliebenen und Sozialrentner Deutschlands," literally, "Federation of the war-damaged, war survivors and old-age pensioners of Germany"), a social service organization, learned of the project and provided additional support in working with, and obtaining materials through, the Americans. Making it look more like a hovercraft than a car, the KR175's front wheels were totally enclosed. Member's car photographed at the Messerschmitt Owner's Club 2003 Lyneham Rally. Photo courtesy of the Messerschmitt Owner's Club. The first working Flitzer appeared in June 1948, followed by the first powered version in September. The early models had a two-stroke Fichtel & Sachs 2.5 horsepower engine. In 1950, this was replaced by a more powerful 4.5 hp Reidel engine, originally developed as a starter for the Messerschmitt ME-262 jet fighter. On the jet, a key inserted into the side of the engine cranked the starter motor. On the Flitzer, there was a foot-operated linkage, but it was still possible to use the key. Starting with the key gave the appearance one was winding up a clockwork toy. While the early Flitzer might have looked like a toy, it was very capable. The car's mettle was tested by a drive over Austria's long Großglockner Alpine Pass, near Salzburg, which at the time included a number of cobblestone sections and hairpin turns. That's a pretty impressive challenge for a tiny, three-wheeled car powered by an aircraft starter engine. Within a year, Fend's small company produced 150 Flitzers and had reached the limits of the Rosenheim facility's capacity. With demand rising, Fend began looking for both more space and a partnership to allow the young company to grow. In 1952, Fend approached Professor Willy Messerschmitt, whose company had produced the formidable Messerschmitt fighters of World War II. Fend had worked with Messerschmitt on various projects during the war, including the ME 262 jet fighter. The timing was perfect; Messerschmitt, forbidden to build aircraft, was looking for work to keep his factory open. Fend and Messerschmitt reached an agreement and Fend moved his operation to Messerschmitt's Regensburg Steel and Metal Construction Company (R.S.M.) in Regensburg. In addition to the increased production capacity, the larger space allowed Fend to move forward with development a larger, two-person variant of the Flitzer he called the Fend 150. The KR200 was the best-selling Messerschmitt model. 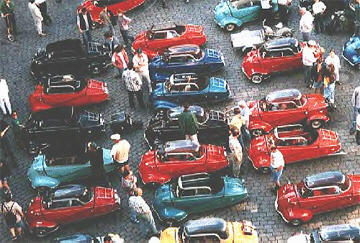 Thousands were sold in a number of countries, including the U.S. Photo courtesy of the Messerschmitt Owner's Club. 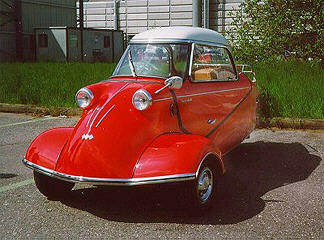 In March 1953, a refined Fend 150 made its debut as the Messerschmitt KR ("Kabinenroller" or "cabin scooter") 175. The KR175 boasted a one-cylinder, two-stroke Fichtel & Sachs 175 cc engine just ahead of the single rear wheel. 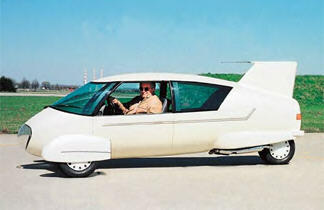 Like the aircraft it resembled, the KR175 had tandem seating, with the passenger sitting behind the pilot, er, driver. The advantage to this arrangement is that weight was distributed along the car's long axis, which improved handling. More like motor scooters than cars, early KR175s had twist-grip throttles and hand clutches. They were even kick-started. There was also no reverse gear, though it should be mentioned that the KR 175 was not the only 1950s-era German micro-car lacking this feature. The new Messerschmitt was perfect for the time. Inexpensive, economical to operate and fairly easy to maintain, it was just the vehicle for Germans needing basic transportation. From 1953 to 1955, the company sold about 11,000 KR175s. Later KR 175s offered more conventional controls, including standard pedals, electric starting and a mechanical reverse. A spiffed-up Tg500 photographed in Hillesheim, Germany in 2003. Photo courtesy of the Messerschmitt Owner's Club. In 1955, a new model was introduced. The KR200 came with a stronger 191 cc Fichtel & Sachs 200 AZL-R engine producing over ten horsepower, improved suspension with a wider front track and open front fenders, which allowed a much smaller turning radius. An electric windshield wiper replaced the manual version previously installed. Among the KR200's other mechanical improvements was a novel approach to backing up; one stopped, shut off the engine and then started it backwards! One of the benefits of a two-stroke engine is its ability to run in either direction as long as there is second timing arrangement to fire the spark plug at the right time. With this setup, the Messerschmitt had four speeds in both forward and reverse. Over its production run, the KR200 was offered in several forms. The standard "KaRo" had an airplane-like dome that swung to the side to allow occupants to enter and exit the car. There was also a convertible, the very rare KR201, some open versions and even a light-duty commercial variant. In addition, Fend never forgot what inspired him to create his original car. Messerschmitts for the physically challenged were always part of the line with 13 variations equipped to accommodate a variety of disabilities. 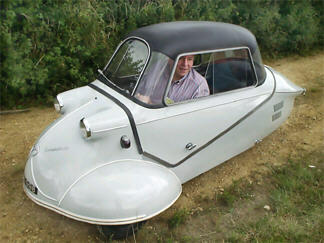 According to Fritz Fend, if you still had a head, you could drive a Messerschmitt. A "Mess-o-Schmitts" captured at Marburg (sorry; I couldn't resist). Photo courtesy of the Messerschmitt Owner's Club. In a year and a half, 16,000 KR200s came out of the Regensburg plant, including many destined for the export markets of the United States and Great Britain. They were a quirky novelty for Americans, but their 50-plus mpg fuel economy was important to Britons, who were contending with the gasoline rationing caused by the 1956 Suez Crisis. 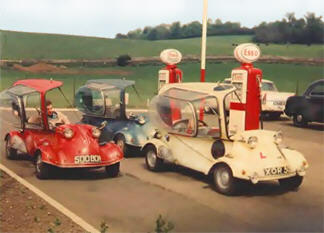 Messerschmitts also enjoyed a hefty tax advantage in England, due to their three-wheeled configuration. In 1956, the Allies lifted the ban on aircraft production and Messerschmitt wanted to go back to the more profitable business of building planes. 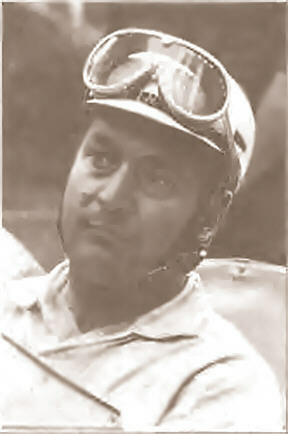 Fend and Valentin Knott, who supplied brakes and hubs for the cars, took over the automobile operation on January 15, 1957. They formed a new company, "Fahrzeug und Maschinenbau GmbH Regensburg" (FMR) and continue building the Kabinenroller. An agreement with Messerschmitt allowed them to continue using the Messerschmitt name for the KR200 and its variants. By this time, the micro-car boom was in full swing and more conventional tiny cars with two-stroke engines were presenting some serious competition. Work had already begun on a successor to the KR200 and the new car made its debut in late 1957. This was the FMR Tg500. At first glance, the Tg500 looks like a Kabinenroller with four wheels, but there were other differences, including a 26 horsepower, 500cc Sachs engine. Three Tigers fueling before a 1963 race. Messerschmitt and Tiger collectors still enjoy racing them. Photo courtesy of the Messerschmitt Owner's Club. The Tg500 was the first Fend car since the Flitzer that did not carry the Messerschmitt name. The agreement worked out when Fend and Knott took over allowed use only on the KR200 and its variants. Fend had hoped to use the name "Tiger," but rights to that name were already owned by other companies, including Krupp in Germany. Officially, the "T-G" stood for "Tourenfahrzeug-Geländesport" or "touring vehicle, cross-country sports," but Messerschmitt fans always called it the Tiger. The Tg500 was an improvement over the KR200 and enjoyed some success in racing. In 1959, Fritz Fend, himself, was at the wheel of one of six Tg500s that participated in the Solitude race (named for the Solitude Castle near Stuttgart, Germany). The cars had a special 19-horsepower, twin 500cc engine from Fichtel & Sachs that gave the cars a top speed of 140 kph (85 mph). In 1959, Fritz Fend was at the wheel of one of the six FMR Tg500s that participated in the 1959 Solitude race (named for the Solitude Castle near Stuttgart, Germany). The cars had a special 19-horsepower, twin 500cc engine from Fichtel & Sachs the gave the cars a top speed of 140 kph (85 mph). Photo from the Solitude Memorial Collection. Unfortunately, the Tg500 was not as successful as its predecessor. For one thing, it was almost twice as expensive and the addition of the fourth wheel meant the Tg500 no longer enjoyed the tax advantages of the earlier tricycle cars. This meant it had to compete with more conventionally styled cars, like the little Austin Sprite. Probably more important, however, was the fact the increasingly prosperous West German economy meant the day of small cars propelled by smoky two-stroke engines was coming to an end. The Tg500 only lasted for less than four years and went out of production in 1961. Major production of the KR200 ended in 1962 and the last one, a KR200 Roadster, rolled off the line at 4:34 PM on August 17, 1964. When automobile production ended in 1964, the Regensburg plant was actually producing more beverage dispensers than cars. But the Messerschmitt was really a success. FMR built over 25,000 vehicles from 1957 to 1964 and some sources say as many as 40,000 Fend-designed cars were sold during the sixteen years they were on the market. Only a handful of competing brands posted better numbers. After the end of the Messerschmitt, Fritz Fend remained active, working as a technical designer while still exploring new ideas. It was Fend who first patented a device which sounded an audible alarm if you left your car lights on after removing the key from the ignition. Sadly, he was ahead of his time; the device didn't become popular until after his patent had expired. Fritz Fend began working on the F2000 in the late 1990s. Sadly, he died before he was able to secure backing to fully develop the project. In the 1990s, Fend began working on a new vehicle, called the F2000. A sleek descendent of the Messerschmitt and TG500, the 1100-pound F2000 had an ultra-low drag coefficient of 0.11 he believed would allow it to reach a top speed of over 110 and get over 100 miles per gallon (2 liters/100 km) at a steady 72 miles per hour. Fend also enjoyed visiting the many fans of the Messerschmitt. One of his last public appearances was in September 2000 at the Regensburg Rally, where one of his original 1951 Flitzers made an appearance, still moving under its own power. Fend spoke about the early days and how the car evolved. Two months later he was gone. Fritz Fend suffered a massive stroke and died on Wednesday, November 22, 2000, at the age of eighty. 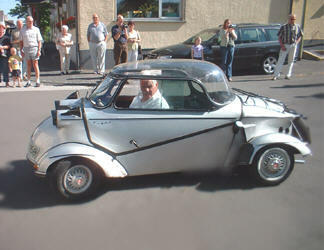 The Messerschmitt remains one of the most popular cars from the micro-car era with collectors. There are groups devoted to the marque in several countries, but one of the most prominent and active is undoubtedly the Messerschmitt Owners Club of Great Britain. It's a great place to learn more about all of the various Fend-designed cars and it's well laid-out and easy to navigate. Is the Messerschmitt prototypical for the U.S.? Absolutely! While exact numbers are hard to come by, a number of Messerschmitts were sold in America and some of them are still running. Messerschmitts are relatively inexpensive to restore and operate and are certainly eye-catching conversation starters at classic auto shows. In 1:87 scale, there are ready-to-run models of the KR200 from Busch and the KR201 convertible from Wiking. The Busch model, first introduced in 1999, is based on the 1955 KR200 and is currently available in three versions: stock, Castrol Oil racer and a "Just Married" model with luggage stacked on the engine cover. Schuco and IMU have produced metal models. Schuco also offered a model of the Tg500. I am embarrassed to admit Oddball's Autos inventory is deficient when it comes to Messerschmitts. There are currently only a couple of the Busch basic models, one red, and one green, on the lot. A KR201 has been on the "to do" list for quite some time. Many thanks to Phil Garner and the Messerschmitt Owners Club for permission to use the pictures and much helpful information. Please note the images credited to the MOC are copyright © 2004 by the Messerschmitt Owners Club, UK and/or Phil Garner. This is the seventy-fifth regular column I have written for Promotex Online and marks the third anniversary of the series. Over the past three years, I have written enough words to fill a reasonable-size book while enjoying one of the best assignments any writer could have. Thank you, Bill, Axel and Bruce, for giving me this opportunity. Thank you, as well, to all who have joined me on my meanderings. One of the best parts of the job is hearing from you. Your comments and suggestions are always welcome and I do my best to answer each e-mail. Next time won't be about cars or airplanes; we're going to take a ride on my favorite railroad: the Grimy Gulch Scenic Railway. Bill Cawthon is a modeler and collector. His primary hobby interests are vehicle models in 1:87 and 1:160 scales and model railroading. He is senior editor of Route 1-87, the magazine of the 1/87 Vehicle Club, and a columnist and product reviewer for Model Railroad News. He is one of the creators of the award-winning "Grimy Gulch" model railroad layout. In real life, Bill is a marketing and public relations consultant for MARK III Systems, a successful information technology company. He also writes for just-auto.com, an international auto industry publication, reporting on the U.S. light vehicle industry. He lives in Houston, Texas with his wife, Marge, and their children. Bill's columns appear twice monthly on Promotex Online. To learn more about him, click here.